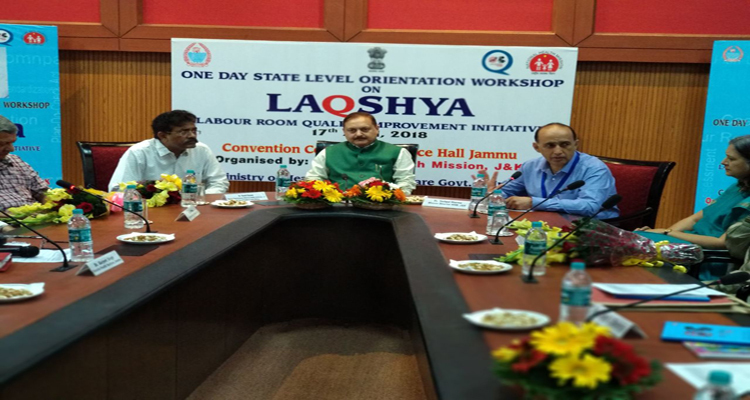 17 April, 2018 State Level Orientation Workshop on “LaQshya” – Labour Room Quality Improvement Initiative was conducted on 17th April, 2018 at Convention Centre, Conference Hall, Jammu by National Health Mission, J & K in collaboration with Ministry of Health & Family Welfare, Govt. of India. The Workshop was inaugurated by Principal Secretary Health & Medical Education, Dr. Pawan Kotwal. Addressing the participants on this occasion Dr. Pawan Kotwal impressed upon the participants the need for imbibing the learning and to apply the same in real work scenario at Hospitals. The goal of the Programme is to reduce preventable maternal and newborn mortality, morbidity and still births associated with care around birth in Labour Room and Maternity Operation Theatre which still remains a major challenge in spite of substantial increase in institutional deliveries. Since the states across India are in the process of implementing Quality Management System using NQAS (National Quality Assurance Standards) to obtain certification of the health facilities, LaQshya programme is intended with desired objectives for improvement in intra-partum and immediate post-partum care. The desired goals of the LaQshya programme include reduction in maternal and newborn mortality & morbidity due to APH, PPH retained placenta, preterm, pre-eclampsia and eclampsia, obstructed labour, puerperal sepsis, newborn asphyxia and sepsis etc., to improve quality of care during delivery and immediate post-partum care, to enhance satisfaction of beneficiaries visiting the health facilities and provide respectful maternity care to all pregnant women attending the public health facility. In first phase the implementation of LaQshya programme is proposed in 11 districts of the state which include Rajouri, Reasi, Kathua, Ramban, Doda & Kishtwar from Jammu Division and Anantnag, Pulwama, Baramulla and Kupwara from Kashmir Division. In addition, two Medical College Hospitals viz SMGS Hospital, Jammu and LD Hospital, Srinagar shall also be strengthened under LaQshya programme. There will be continuous process of gap analysis and action planning to plug gaps in the labour rooms and OTs through NQAS check list. Mission Director, NHM, J & K, Dr. Yashpal Sharma welcomed guest faculty and the participants on the occasion. Dr. Gurdeep Singh, Director Health Services, Jammu, Dr. Samir Mattoo, Director Family Welfare, MCH & Immunization, J & K were among senior Officers of the Department of Health who attended the workshop. The participants of the orientation workshop included Chief Medical Officers, Medical Superintendents, HoD Obstetrics & Gynecology, GMC Jammu/Srinagar. The State Officers from NHM, J & K including Divisional Nodal Officer Jammu, Programme Managers, State Programme Manager, Associate Programme Managers, Assistant Programme Managers, State Officers from Financial Management Group and other officials from State Health Society, NHM, J & K participated in the orientation workshop. The Resource Persons and the Guest Faculty for the workshop included Dr. Dinesh Baswal, DC I/C Maternal Health, Dr. Apurva Ratna, Technical Officer, PMU LaQshya, MoHFW, GoI, Dr. Gurinder Randhawa, Consultant NHSRC, Dr. Leila Caleb varkey, MoHFW, GoI, Dr. Rashmi Asif, Director Clinical Services & Trainings, Jhpiego and Dr. Apoorv Jain, Programme Officer, Jhpiego. Speaking on the occasion, Mission Director, National Health Mission, J & K, Dr. Yashpal Sharma stressed on the participants and NHM, J & K Officers to make the orientation workshop a two way communication through active involvement for maximum learning and achievement of desired outcomes.